Evolving ITSM – Commentary, thoughts, stories and discussion from the changing world of IT service delivery. At DevOps conferences, I’ve observed some very negative sentiment about ITIL and ITSM. In particular, the Change Advisory Board is frequently cited as a symbol of ITSM’s anachronistic bureaucracy. They have a point. Enterprise IT support organisations are seen as slow, siloed, structures built around an outdated three-tier application model. By enabling small, point releases, systems are growing in a more resilient way than monolithic releases tended to achieve. In my experience, there is little mention of the customer at DevOps events. DevOps is seen, correctly, as a new and improved way to drive business value from software development, but the thinking feels very “bottom up”. ITSM commentators seem to have taken the same starting point: drilling into minutiae of process without really considering the value that ITSM should be looking to bring to the new world. Facing a queue of two tickets, or ten tickets, or one hundred tickets, the application team has to decide what to do first. This is where things start to unravel for an idealistic, full-stack, “you break it, you fix it” devops team. Which issues are causing business damage? Which are the most time critical? Which can be deferred? How much time should we spend on this stuff at the cost of moving the product forward? This is the stuff that ITSM ought to be able to provide. The “S” in ITSM stands for “service”, not process. The heavy focus on process in this discussion (particularly two specific process, close to the point of deployment) has been a big mistake by both communities. It is wholly incorrect to state that DevOps is predominantly contained within Release and Change Management. Code does not appear appear spontaneously in a vacuum. A whole set of interconnected events lead to its creation. An interesting question came up at the end: What percentage accuracy is good enough, in an IT Asset Management system? It’s a question that might get many different answers. Context is important: you might expect a much higher percentage (maybe 98%?) in a datacentre, but it’s not so realistic to achieve that for client devices which are less governable… and more likely to be locked away in forgotten drawers. However, I think any percentage figure is pretty meaningless without another important detail: a good understanding of what you don’t know. Understanding what makes up the percentage of things that you don’t have accurate data on is arguably just as important as achieving a good positive score. The digital services of today and the future will likely be underpinned by a broader range of Asset types than ever. A single service, when triggered, may touch everything from a 30-year-old mainframe to a seconds-old Docker instance. Any or all of those underpinning components may be of importance to the IT Asset Manager. After all, they cost money. They may trigger licensing requirements. They need to be supported. The Service Desk may need to log tickets against them. The trouble is, not all of the new devices can be identified, discovered and managed in the same way as the old ones. The “discover and reconcile” approach to Asset data maintenance still works for many Asset types, but we may need a completely different approach for new Asset classes like SaaS services, or volatile container instances. The IT Asset Manager may not be able to solve all those problems. They may not even be in a position to have visibility, particularly if IT has lots its overarching governance role over what Assets come into use in the organization (SkyHigh Networks most recent Cloud Adoption and Risk Report puts the average number of Cloud Services in use in an enterprise at almost 1100. Does anyone think IT has oversight over all of those, anywhere?). However, it’s still important to understand and communicate those limitations. With CIOs increasingly focused on ITAM-dependent data such as the overall cost of running a digital service, any blind spots should be identified, understood, and communicated. It’s professional, it’s helpful, it enables a case to be made for corrective action, and it avoids something that senior IT executives hate: surprises. Question mark image courtesy Cesar Bojorquez on Flickr. Used under Creative Commons licensing. The phrase, “the Internet of Things”, is believed to have been coined by a brand manager at Proctor and Gamble. Kevin Ashton, in a 1999 presentation, envisaged an exponential growth of connected devices, as supply chain logistics got smarter. Today, the Internet of Things is seen as one of the most significant technology trends, with analysts predicting that the number of connected, smart devices will grow to tens of billions over the next few years. Much of this proliferation will happen in the workplace. For Software Asset Managers, this could have significant implications. The Internet of Things will not merely be a corner case for SAM: it could impact some of the biggest contracts, with key vendors like Oracle. Here, 15 fixed temperature devices are communicating directly with an Oracle database. There are also 30 forklifts, each of which has a transporter which also writes to the database. In this case, a total of 415 licenses are required: 15 for the temperature sensors, and 400 for the humans operating the forklifts (because “the forklift is not a non-human-operated device”). In the past, I’ve used this example, only semi-seriously, to illustrate what might happen if the Internet of Things grows at the speed of the pundits’ projections. Recently, the 2015 Gartner Predicts report for the Internet of Things projected an almost 28-fold growth in connected devices from 2009 to 2020. The year 2009 is rather pertinent, because Oracle’s forklift example seems to have first appeared in the Software Investment Guide in that year (here’s an example at the Internet Archive). 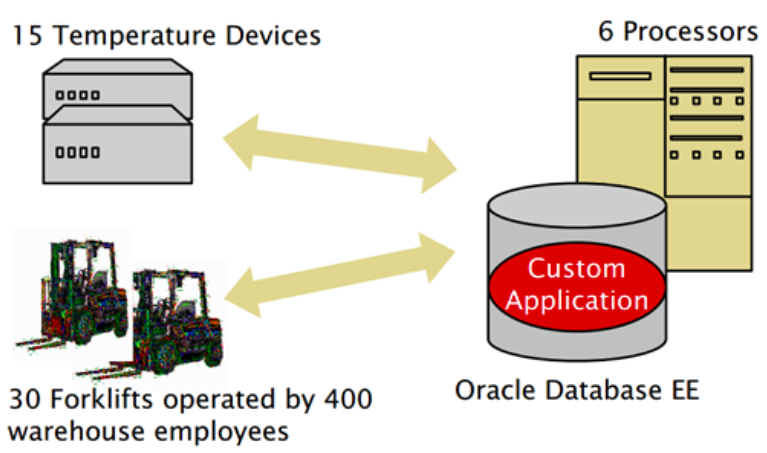 If we crudely apply the Gartner’s connected growth rate to the number of devices shown in Oracle’s forklift example, there would be well over 1200 connected devices to license by 2020. That’s a trebling of the cost. Today’s “smart” forklift includes diagnostics that allow the equipment to signal when it needs to be serviced, speed controls, anti-slip technology that monitors wheel spin and improve traction on slick floors, collision detection, fork speed optimization, and more. All of a sudden, my deliberately far-fetched example didn’t seem quite so unlikely. As always, in Software Asset Management, the challenge is unlikely to be simple or contained. Software Asset Managers deal with many vendors, with many license types. Many of those licenses may depend on counts of connected devices. Many contracts pre-date the Internet of Things, which means costing models are outdated. Unfortunately, that’s unlikely to make the consumer any less liable. In part 2 of this article, we will look at another major challenge already arising from the Internet of Things: the increasing application of software-style license terms to hardware. Mention the role of “Configuration Manager” at an ITSM conference, and then use the same description at an Infrastructure Management conference, and your respective audiences will visualise completely different jobs*. So, it was with some curiosity that I arrived this morning for the first day of the Configuration Management Camp in Ghent. This particular event falls squarely into the infrastructure camp. It’s the realm of very clever people, doing very clever things with software-defined infrastructure. A glance at the conference sponsors makes this very clear: it includes Puppet Labs, Chef, Pivotal, and a number of the other big (or new) names in orchestrated cleverness. While this is not the ITSM flavour of Configuration Management, however, today’s conference really made it clear that this new technology will become more and more relevant to the ITSM community. In short, ITSM should make itself aware of it. The tools here have underpinned the growth of many recent household-name startups: including those internet “unicorns” like Facebook and Uber which have risen from zero to billions. They’ve enabled rapid, cloud-driven growth in a brand-new way. This new breed of companies have firmly entrenched DevOps methodologies, with ultra-rapid build, test, and release cycles, increasingly driven by packaged, repeatable scripts. It primarily takes place on cloud-based open-source software stacks. As a result, there’s not quite as much focus on resource and commercial constraints as we find in big enterprises. But here’s the crux: methods like this will surely not remain solely the preserve of the startups. As business get deeper into digital, there’s increasing pressure on the CIO from the CEO and CMO, to deliver more stuff, more quickly. As the frontline business pushes its demands onto IT, long development and deployment cycles simply won’t be acceptable. And, with equal pressure on IT’s costs and margins, these technologies and methods will become increasingly attractive. Rapid innovation and deployment is becoming essential to business success: PuppetLabs 2014 State of Devops study recently claimed that strongly performing organizations are deploying code 30 times more often, with 50 times fewer failures. Okay, those numbers come from squarely within the Devops camp, but they are credibly reinforcing past analysis such as MIT Sloan’s 2007 classic study on “the alignment trap”. IT can’t just be a ponderous back-end function if a company wants success. That’s not to say that this conference is providing the answers. I’d argue that Configuration Management Camp is the “bottom up” conference to an ITSM conference’s “top down”. Some of the toolsets on display here are very granular indeed. Many of the presentations were slides, or live demos, full of slightly arcane command-line-interface text input. We watched individual clusters get provisioned, quickly, impressively, but devoid of context. However, there was also a sense of an increasing imperative to start connecting those dots: to define the applications and their inter-dependencies, and ultimately, the services. We’ve seen talks today with titles like “Configuring Services, not Systems”. Dianne Mueller of Red Hat OpenShift described new tools which focus on the deployment of applications, rather than points of infrastructure. I spoke with more than one person today who described DevOps starting to meet “reality” – that is, the day-to-day expectations of an enterprise environment. There is a feeling of “cutting edge” here, probably justified, but the counterpoint to that might be that this community tends to see “traditional” IT is seen as slow and clunky. PuppetLabs founder and CEO, Luke Kaines dismissed this: “The enterprise space doesn’t move slowly because they’re stupid or they hate technology. It’s because they have… what’s the word… users”. One thing that was clear today was that these technologies are only in their infancy. Gartner recently identified Software Defined Infrastructure as one of its key trends for 2015. Forrester have declared that Docker, the rapidly-emerging containerisation technology, will “live up to the hype and rule the cloud”. And that’s why IT Service Management needs to take note. We can’t understand the services we provide our customers, if we don’t have a grasp on the underlying infrastructure. We can’t formalise change control without getting the buy-in of the technical experts for whom rapid infrastructure shifts are a command-line prompt away. We can’t help prevent uncontrolled software spend, or inadvertent license breach, if we don’t proactively map our contracts onto the new infrastructure. With change cycles moving from weeks to seconds (it was claimed today, in one session, that Amazon deploys code to production on a sub-one-second interval), established ITSM practices will need to adapt significantly. So, if it feels like ITSM’s “top-down” and infrastructure configuration management’s “bottom-up” are striving to find a connection point, it also feels like that join has not yet been made. It’s up to IT as a whole to make that connection, because if we don’t do it, we’ll end up repeating the lessons of the past. But faster. It’s going to be a fun challenge to face. This is exciting stuff. *ITSM: defender of the CMDB. Infrastructure: server deploying and tweaking wizard. Right? On 27th January 2010, Steve Jobs unveiled the iPad. If you have 90 minutes or so to spare, that launch presentation is a fascinating watch. Gates called it wrong, particularly in backing netbooks over tablets. By 2011, tablets were selling twice as many units as netbooks. (Note to readers in the future: Netbooks were small laptop computers which didn’t have touchscreens or detatchable keyboards. Yes, I know!). Tablets, led by the iPad (to say the least), put a huge dent in the PC market, leading to its longest decline in history. One of the most profound changes that the iPad brought was a change in user expectations. Since the advent of the WIMP (Windows-Icons-Mouse-Pointer) interface in the 1980s, most business software took the form of a form. Users interacted with clickable, typeable boxes. Tablets, without a pointer or a physical keyboard, don’t adapt well to “paperless form” interfaces. It’s hard to click with a finger in a small box, and it’s not great navigating from field to field, typing into them one by one, either. Some might have expected that hardware would make the shift to accommodate expectations. Instead, the applications themselves changed. The tablet brought in new user experience designs, with great success. Developers and designers quickly built on the lessons they’d already learned with touchscreen smartphones. They learned to produce tactile apps, making the most of swipes and gestures and movement. It’s arguably much more intuitive and friendly, as anyone who has ever given a modern touchscreen device to a toddler will attest. It’s also a great opportunity to deliver a more productive experience too. Applications like Shazam and Uber have taken this to an extreme: A single press on the screen replaces complex and clunky keyboard-and-mouse driven interactions. This influence is even finding its way back to the desktop. PCs aren’t dead yet, and they are still holding their own as the superior platform for many use cases. But the influence of the iPad is pervasive. There’s a lot less tolerance amongst users for business applications which look like their tax form, with a save button. There is no tolerance at all for that in consumer applications. Harnessing, and taking advantage of those expectations enables better software with better outcomes. A tool like Smart IT enables tablet interaction for ITSM, but also carries many of the design and efficiency principles to the desktop. The result is better productivity, a smarter Service Desk, and happier stakeholders on both sides of the service relationship. Mobile ITSM isn’t only about field support: It’s about everyone. When we built the new Smart IT UX for BMC Remedy, we were determined to allow ALL IT Support Workers to be Mobile. Why? Because everyone can benefit from mobility. In the short history of enterprise mobility, mobile business applications have generally focused on two specific user groups. The first is the group of users for whom being on the road is the bulk of their job, such as field engineers: they go to a location, perform some tasks, move on to the next place. The second group is those who might be based at a desk in an office, but who move around through a series of meetings, on and off-site. For these users, the primary purpose of mobility has been continuity of communication (with the weapon of choice having historically been the keyboard-equipped Blackberry). For most other users, performing most other business tasks, the desktop computer (or desk-based notebook computer) still remained the key delivery mechanism for business applications. Today, this is an outdated philosophy. I recently stood in a lift at a customer’s office. There were four people in that elevator, and there were seven smartphones on display. Okay, two of them were mine (I’m a mobility product manager, after all), but that is still a notable average. Even in the short moment offered by a journey of just a few floors, those office-based employees found a moment to communicate. Whether that communication was work-based or personal, one-way or two-way, is irrelevant. The point is that the time was being used to perform those tasks in a way that could not have happened just a few years ago. The opportunity for business software tools to take advantage of that new computing power is huge, and growing. The very structure of the traditional office is under pressure, as users become more mobile and more technology enabled. That generation of teenagers will soon enter the workplace having had a completely different, and more universal grounding in technology than we select geeks who owned the Tandy 1000s and Sinclair Spectrums of yesteryear. Mobility for the consumer is now table stakes. So why not extend this to the people serving those consumers? Mobility, simply, provides great opportunities to enhance the role of the service representative. When I arrived at a Westin Hotel in Chicago last month, I needed to speak with reception, and joined the line of people at the check-in desk. However, I was approached by a staff member with an iPad. They were quickly able to answer my question. The Starwood Hotels group, he told me, aims to keep its hotel staff on their feet, closer to customers, delivering service in a more dynamic way. Even the group’s CEO, Fritz van Paasschen, has abandoned his desk and PC: a Wall Street Journal article in November 2014 revealed that he works entirely on tablet and smartphone (van Paasschen’s office contains no desk – just a boardroom table and a couch). In an IT Service Management environment, the case for mobility for field support users has long been clear: the alternative being a hotch-potch of printed dockets, slow communication, and inconvenient (or omitted) retrospective updates to systems of record, back at a field office. But even in the office, it’s important to realise that good IT service, like all good customer service, combines communication, expertise, initiative and process. Many people involved in that process are not at their desk all day: they may be in meetings, or travelling between sites, or sitting with colleagues. If those people can only access their support tools from their desk, then gaps appear. Twenty minutes waiting for input from an approver or technical expert could amount to twenty minutes more waiting time for the customer, or even a missed window to communicate with the next person in the chain (and hence an even bigger gap). Mobilising people – properly – fills those gaps, even in the office. And, as the IT department’s customers get more mobile, the best way to support them is often to become more mobile. When we built the Smart IT interface for BMC Remedy, released in September 2014, this was the philosophy of our mobile approach: ITSM should be mobile for every user, whether they are field support technicians roaming a wide area, or a service desk agent taking a five minute break at the coffee machine. The tool needed to provide all the features they need, including comprehensive teamwork features and assistiveness, so that they are never forces to find a desk or wait for the slow boot-up of a traditional PC. We released the tablet version of Smart IT on day one, and the phone version, scheduled to be live in December 2014, has been already received a great reception in demonstrations at customer events. As with Smart IT in general, there’s no additional cost over and above a standard Remedy ITSM license. Our work with our ITSM customers has shown us, and them, that there are huge and real business benefits to seamless and comprehensive mobile experience. Time not spent in front of a PC no longer needs to be time spent not helping customers. Properly equipped, an increasingly mobile-focused user base is sure to find those benefits, and that means faster, better outcomes for IT’s customers.